Mobile Fringe, a retail mobile app developer, is making you an offer you can’t resist – or even escape, once you’ve opted in. The Toronto company’s location based service (LBS) tool Push a Deal guarantees that consumers who download the app will receive a message alert on their smartphones about an ongoing deal once they are within a 500 metre radius of the store offering it. The idea is simple. Retailers sign up with Mobile Fringe to have their deals broadcast over the Push a Deal channel. Smartphone users consent to taking part in the arrangement by downloading the Push a Deal app on their phones. Using global positioning system (GPS) technology the app will trigger a “push” of the store-offered “deal” via a text or email message that phone owners receive on their handsets when they cross the “geo-fence” set by the merchant. Hopefully, the deal entices the smartphone owner to enter the store in their proximity and avail of its offer. That way, the participating merchant rings up a sale and Mobile Fringe takes 25 per cent off the transaction. Push a Deal could be seen as a natural evolution of the group buying trend that swept Canada via the United States a little over a year ago. “Retailers who have signed up with us have been very happy with the results so far,” according to Mike Egan, business development manager a Mobile Fringe. He said among the businesses that have signed on with Mobile Fringe are Moxy’s Classic Grill, Swiss Chalet, Second Cup and Harvey’s restaurant. In the movie Minority Report there is this a scene where Tom Cruise’s character is bombarded by personally targeted visual ads that pop out of the air as he walks through a mall. Egan assures consumers and merchants that no such thing will happen with Push a Deal. “Merchants and consumers will have the option to customize what is broadcast and what is received,” he said. Steve Sorge, CEO of Mobile Fringe, says Push a Deal is literally a better deal for merchants than group buying. “One of the main advantages of Push a Deal is that the deals are being offered to people who are already interested and close to the store where they can get the deal,” he said. Another come on for retailers, Sorge said, is the better revenue model that Push a Deal offers. With most group buying and social buying clubs, retailers are typically required to offer discounts of 50 per cent or more over their regular prices. “From whatever sale the retailer makes, most group buying firms take 50 per cent of that,” said Sorge. With Push a Deal, retailers determine what the deals they can offer. It could be 50, 75, 10 per cent or less. “On our end, we only take 25 per cent of that retailer makes from the deal,” Sorge said. “Our technology tracks the immediate location of the phone. We see when a person redeems a deal, but we have no way of linking the transaction of the location data to a specific identity,” Sorge said. He said Mobile Fringe only has the email address of the user so they can send out the offer but the company does not retain any credit card or financial information. 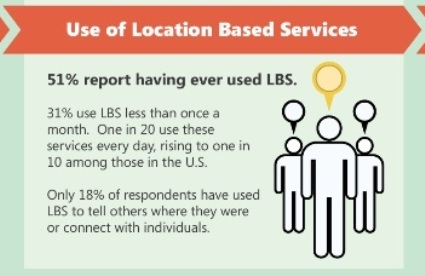 Location based services are poised for growth according to a survey released by Microsoft Corp.The survey which covered Canada, the United States, Japan, Germany and the United Kingdom, indicated that geo-location based retail tend to motivate consumers into action. 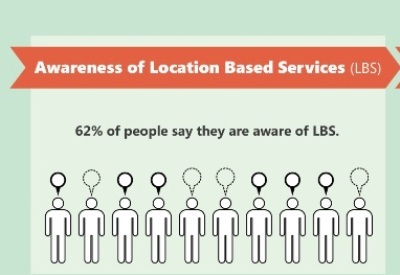 Nearly 18 per cent of the respondents claim to have seen a LBS-based add. “Nearly half (46 per cent) of these consumers have taken some type of action based on exposure to the ad,” the survey noted. The actions taken include redeeming the coupon offered or visiting the store. 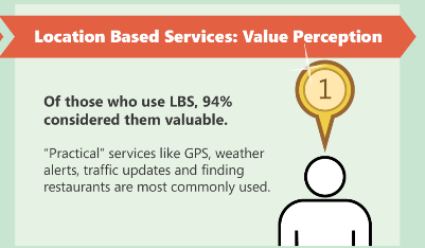 At least 80 per cent of the respondents also indicated that they found LBS retail ads to be “very” or “somewhat” valuable.